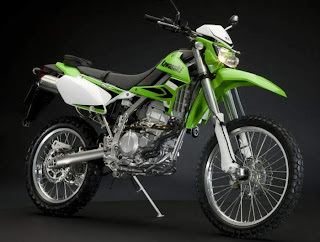 Kawasaki KLX 150 dirt bike-style is still less comfortable if you are still the standard manufacturer. This differs from the Kawasaki KLX 150 alerts in 2010 that looked at the garage Asep Hendro Racing Sport (AHRS). KLX Green berkelir typical Japanese motorcycle manufacturers are experiencing some adventure-style changes. Composition starts from the front by replacing the handlebars and integrate racer AHRS concoction. This change is intended to get a more comfortable steering position and easy to control when invited to roam the streets off-road. Also attached green berkelir beremblem protector Acerbis hand. Touch of modification seen also in the front suspension - elevated to 5 cm. Also front and rear gears and chains using TK Japanese concoction. In order to get ride comfort at the rear swing arm is extended up to 1.5 cm. While the two off-road tires berspesifikasi beremblem Pirelli Scorpion XC (80/100-21) and Scorpion MX (100/100-18) is used. To get extra power for the engine, replaced the standard exhaust muffler AHRS Vector Freeflow.